Hi everyone - Paul here. Thanks for all the responses to my other posts - really appreciated. Today just wanted to ask about my soft top on 4.2 S1 which is a new refurbishment, but regardless it still leaks just above the steering wheel where it joins the windscreen. I have put some extra rubber trim along the top of hood to make it fit tighter to top of screen but it still comes in quite a lot - enough to make it a disaster when it rains. 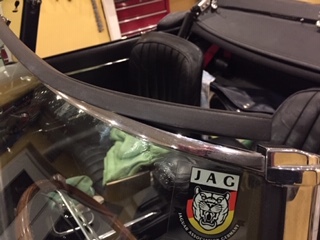 I have an MGB as well which is much less cared for and i could drive that through a monsoon and no water would come in, yet the soft top is plastic and does not look half as study as the one on the jag. Any thoughts on other things i could try? well if it is any consolation , mine does the same thing. new top new seal, but it still makes me laugh because each time the wipers sweep up the windscreen they just push the next wave in on my lap! someone on here came up with using a bicycle tire inner tube cut to length and then sealed at both ends. leaving the stem to tuck under after inflating. If I am not mistaken motor homes use the same design to seal up slide outs once extended. probably want to use a road bike tube as they are narrower and use a long skinny valve stem that would be easier to tuck under. I dont drive in enough rain to warrant a major fix, but I do carry towels if it looks like rain. A couple of friends of ours with OTSs simply stick a length of waterproof tape across the top covering the edge of the hood and the top of the screen. Apparently does the trick - I don't have an OTS, so can't confirm! All the above -especially the towel. The problem is that by the time you have the vinyl or mohair attached, it’s often too late to adjust the frame sufficiently to make the seals work. Because fitting the top is late in the restoration process, people sometimes rush it. A pro can work fast and effectively, the rest of us have to choose one or the other and many farm the job out. DIYers should plan an extra day spent adjusting the front bow overlap, including the eccentric stop pins many don’t even notice. Sometimes even the shape needs adjusting, especially if it has welded repairs. Even brand new may need adjusting to the individual screen top chrome shape and tension. You might need another day adjusting the door glass and cant rail sheet metal. Eventually you should have done enough trial and error and fettling to achieve gaps that are hopefully even and bridgeable by the normal seals, rather than tapered or excessive and impossible to make water tight. When the gaps are good the cover can be attached and finally the seals fitted. I use a U-shaped rubber profile, that I put on the chrome strip on top of the wind screen when I close the roof. When open, I put it right between the mirror rod and the windscreen on top of the dashtop panel, so that it isn't bent or in the way. The both vertical arms of the U have a thickness of approx 2mm. The horizontal bottom (when mounted: top) line of the U was to thin with the approx 2mm of the profile to fully proof the roof-gap, so I added another approx 3mm stripe of a very smooth rubber and glued it to the U-profile. The result is: even in heavy rain at Autobahn-speed there is nearly no water ingress between the roof and the windscreen. Join the club !! I have owned a Series 3 since new...over 45 years, and always had a few leeks, until I finally found a foolproof solution !!! Don't drive in the rain, unless an absolute emergency !! Happy motoring !! Stay dry ! You guys with OTSs don’t have problems with water ingress, you know it is coming in through the screen to hood gap. It isn’t a problem, it’s a fact. You get used to it. I know many roadsters are driven with the top down in all weathers. If it rains you just drive a little faster and the rain goes completely over the top. The problem with water ingress is with the coupes. Where the hell do you start looking? Windscreen seals? Doors? Rear hatch seals? I know my car leaks water when it rains. I haven’t glued the carpets and underlay down, so I can always dry the car out after a soggy run. I have other leaks too, radiator fluid, engine oi, gearbox oil, axle oil. The only things that are fluid tight (at the moment) are the hydraulic circuits. Welcome to E-Type Jaguar ownership. All great thoughts. Jaglex any chance u could post a picture of the piece of rubber so I can copy the way und you do it? We did that through Wales on the E-Type run, although we came close to closing it down the country lanes when the speed was too slow. Seriously, I had mine replaced a year ago by a "reputable" firm. Plastic out, mohair in, etc. It leaked like a sieve. I took it back and they improved it but still leaks, I can't fully close the windows whilst driving and it buffets terribly if you open the window too much at speed. Other than that, it looks nice I'll live with it and keep the gaffer tape handy. I replaced my hood with a mohair one from Aldridge two years ago. As stated in several forum threads I started with getting the frame and the wooden header rail right. I went for " the top screen rail must be hidden by the front hood chrome trim with hood up". First thing was the door drop glass (new from Triplex/Pilkington), checked with the hardtop and then adjusted the hood frame incl. cantrail segments. I measured, dismantled and adjusted the frame several times. After that the shaping of the header rail (using a new seal from Baines- not ideal) alone took me several days. The hood itself was quite straightforward, although I had to redo it immediately where glued to the header rail. After quite a few miles and going through some wet-dry cycles, I had to retension it again at the B-posts and at the header rail. This was due to zero experience how much tension is needed right from the start. After some adjustments I still had serious water leaks left at the lower B-post; I had forgotten to apply sealer between hood and B-post chrome. Result: the header rail is water tight, but the hood is not 100% leak free. Hi Paul, I took two pictures of the rubber fitted to the screen (one end lifted, to show a little better) to clarify my confusing write up. As you can see, the inside measures of the U-profile is 10 x 10mm and the thickness of the U is 2mm. On the top (bottom) of the U I glued a flat stripe soft rubber of (again) 2mm thickness. I thought about taking an L - profile instead of a flat one, so that water crawling up the windscreen (driven by the wipers and the headwind) will be moved further up on the soft top and away from the link between screen and soft top. But I didn't because the L would collect water exactly there, when the car is standing in the rain. Give it a try, the profiles cost pennies and it's not much work. Maybe it helps your car as it did mine. 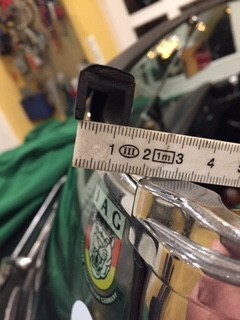 In my experience the eccentric screws can be rightly ignored as they simply adjust the position of the front section when the screen is folded back and are, on my car at least, irrelevant to any sealing issues. Furthermore, whilst I may work slowly, most DIY'ers will need a lot more than an extra day to get this area right, particularly as regards David's pet bête-noire which is the over-lap covering the chrome strip. Students of the extreme may find some nuggets here. PS - No, my screen doesn't leak ; but to make up for it, Yes, the doors do. Great photos am on the case now getting some rubber and will Update in a week or so. Thanks so much. Had mine done recently by Aldridge. There were problems with the frame sitting right and the hood pan needed to be extended a little. After a few attempts and some neoprene packing strips, it seals perfectly. One thing to look out for is a poor fitting chrome strip along the top of the windscreen. Water can come under that also, so a light silicon sealant was used. There were also gaps in the windscreen sealer to the chrome A pillar caps that needed a little silicon also. You can test simply with a spray bottle and an airline to try push the water up into the seals. Then open up and you will see where the water sits on the chrome. Again thanks - i was wondering how i would test it. Rubber purchased so will give that a go and if that does not work i will go to where u had yours done and let them have a go at adjusting it. Ah - Switzerland might be difficult!